UPDATE for July 2018! 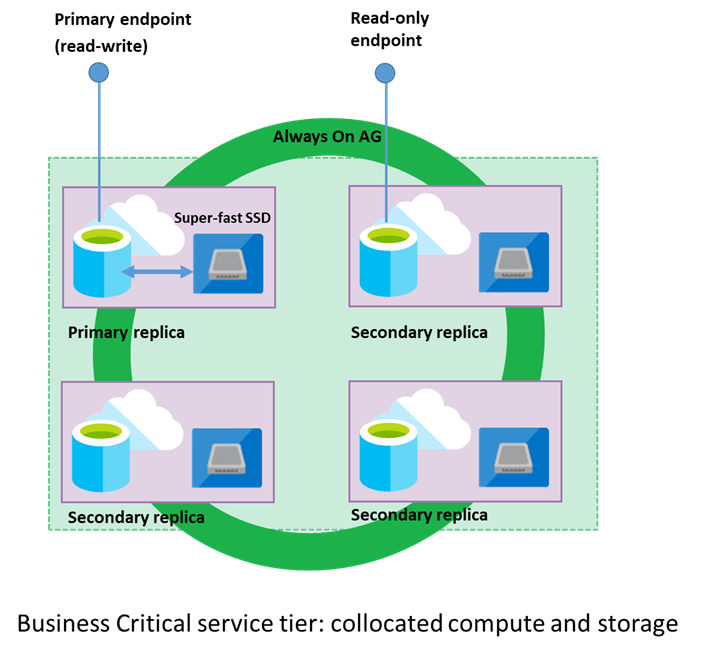 We’re excited to announce the preview of the Business Critical performance tier in Azure SQL Database Managed Instance, following up on the March 2018 preview announcement of the General Purpose performance tier. Business Critical is built for applications with the highest IO requirements. It offers the best resilience to failures using several isolated Always On replicas. In addition to premium IO performance and high availability, Business Critical also offers additional features such as in-memory OLTP and 1 additional read-only replica (Read Scale-Out). To learn more, see the Business Critical service tier documentation page. Also with this July update, both the General Purpose and Business Critical performance tiers now support instances with 64 and 80 vCores, in addition to 8, 16, 24, 32 and 40 vCores. Business continuity is also improved with the ability to easily restore your databases to other instances within the same region and to a point in time within the supported backup retention period. Managed Instance is a new deployment option in SQL Database that streamlines the migration of SQL Server workloads to a fully managed database service. It provides full SQL Server engine compatibility and native virtual network (VNET) support. Azure SQL Database is a fully-managed database service, which means that Microsoft operates SQL Server for you and ensures its availability and performance. SQL Database also includes innovative features that can enhance your security and business continuity to levels you’ve never experienced before. For example, you can rely on built-in high availability (HA), automated backups, and point-in-time restore to ensure business continuity. With a comprehensive security portfolio, you can implement intelligent features like Threat Detection which acts like an alarm system over your database, providing you proactive alerts about potential malicious activities—imagine virtually hands-free administration for hundreds to thousands of your SQL Server databases! In addition to the benefits of a fully-managed service, Managed Instance enables an instance-scoped programming model that provides high compatibility with on-premises SQL Server (2005 through current versions), reducing or eliminating the need to re-architect applications and manage those databases after they are in the cloud. With Managed Instance, you can continue to rely on the same SQL Server tools you’ve used and loved for years—in the cloud, too. These include features such as native database restore, SQL Agent, Database Mail, Service Broker, Common Language Runtime (CLR), and Change Data Capture. To increase productivity and lower total cost of ownership, you can also lift and shift your SQL Server Integration Services (SSIS) packages into a managed SSIS in Azure Data Factory (ADF) environment, where they will be stored in SSISDB hosted by Managed Instance and executed on Azure-SSIS Integration Runtime. To streamline your migration to the cloud, Microsoft announced the general availability of Azure Database Migration Services (Azure DMS) support for Managed Instance. This enables SQL Server customers to more easily migrate their workloads to SQL Database Managed Instance. Azure DMS reduces the complexity of your cloud migration through a single, comprehensive service. The service supports migrations of homogeneous/heterogeneous source-target pairs, and the guided migration process is easy to understand and implement. Customers like DocuSign overwhelmingly see the value SQL Database Managed Instance brings to their productivity and scale initiatives. To learn more, visit the Database Migration Service page. Managed Instance is fully contained in your virtual network, so it provides the ultimate level of isolation and security for your data. You can now get the benefits of the public cloud while keeping your environment isolated from the public Internet. The following diagram shows several options to deploy various application topologies completely in Azure or in a hybrid environment, regardless of whether you choose a fully managed service or hosted model for your front-end applications. Any of these options allows connectivity to a SQL endpoint (TDS – tabular data stream), only through private IP addresses, which guarantees the optimal level of isolation for your data. 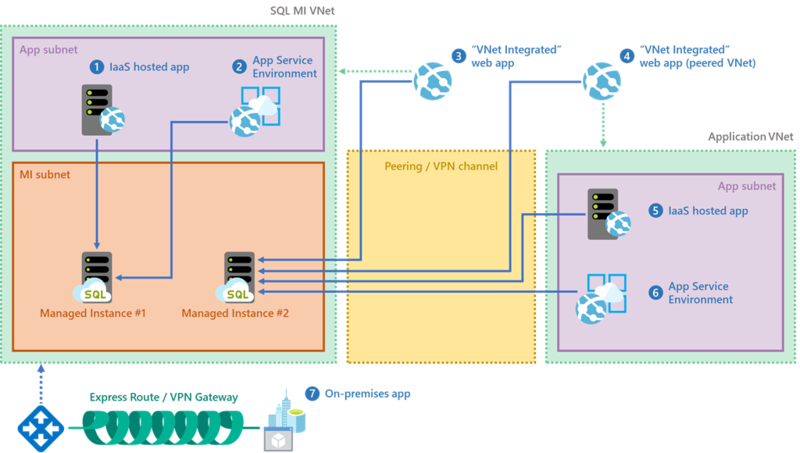 For more details, see How to connect your application to Managed Instance. Managed Instance uses a pricing model based on virtual cores (vCores) that provides flexibility in selecting the right level of resources (storage and compute), making it easy to size workloads by comparing to physical cores on-premises. For more information, see the SQL Database pricing page. We’ve made Managed Instance a great economic choice, too, by offering support for Azure Hybrid Benefit for SQL Server. This benefit helps you maximize the value of your current SQL Server licensing investments and accelerate your migration to the cloud. Azure Hybrid Benefit for SQL Server is a benefit exclusive to Azure that enables you to use your SQL Server licenses with Software Assurance to pay a reduced rate on Managed Instance. Additionally, you will be able to migrate your SQL Server Integration Services (SSIS) licenses to Azure Data Factory for a reduced rate with Azure Hybrid Benefit. If you are a SQL Server Enterprise Edition or Standard Edition customer and you have Software Assurance (SA), the Azure Hybrid Benefit for SQL Server can help you save up to 55%* on Managed Instance. At the time of this announcement, Managed Instance is initially available in 19 Azure regions: Australia East, Australia Southeast, Canada Central, Central US, East Asia, East US, East US 2, Japan East, Korea Central, Korea South, North Central US, North Europe, South Central US, South India, Southeast Asia, West Europe, West India, West US, and West US 2. Managed Instance will be made available in more Azure regions through the course of preview. Try Managed Instance today and let us know what you think! If you’re ready to migrate to a fully-managed database service, enroll into the preview from the Azure portal and accept the Preview terms. Given high demand, we are managing acceptance into preview to ensure the best experience for our customers. Once you enroll in the portal, our goal is to confirm your status within three business days. Once accepted, you’ll be able to return to the Azure portal to complete the provisioning process. Otherwise, you’ll be invited to re-enroll at a later date. For more details on user scenarios and a list of features and capabilities, visit the Managed Instance documentation page. We’re excited for you to try SQL Database Managed Instance and experience virtually hands-free administration on all your SQL Server databases! *Savings based on eight vCore Managed Instance Business Critical in East US Region, running 730 hours per month. Savings are calculated from full price (license included) against base rate (applying Azure Hybrid Benefit for SQL Server), which excludes Software Assurance cost for SQL Server Enterprise edition, which may vary based on EA agreement. Actual savings may vary based on region, instance size, and performance tier. Prices as of December 2017, subject to change.